Why this Middle East nation is important! 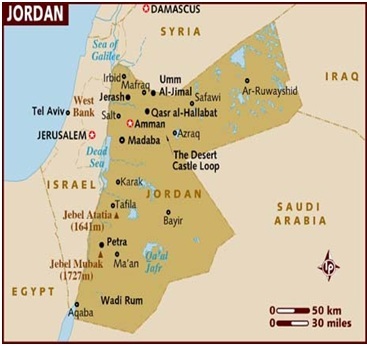 Jordan occupies a strategic location in the Middle East, wedged between Israel and Saudi Arabia. To its north and northeast lie Syria and Iraq – the region’s main trouble spots that have drawn in regional and global powers like Iran, Turkey, Russia and the United States. Jordan is now home to 660,000 Syrian refugees, nearly 7 percent of its total population. For years, Jordan has been a fairly stable country in a volatile region. But recently we have seen a change in this pivotal Middle East country, as thousands of demonstrators took to the streets recently to protest government austerity measures. How much does it really matter that a small country like Jordan is experiencing the sort of social unrest that is normal in this chaotic region? It matters much! Israel shares its longest border with Jordan, and a majority of Jordanians are of Palestinian origin. Jordan relies heavily on Israel for its national security, and Jordan helps Israel contain potential dangers. But Israel is exposed at the moment – Israel Defense Forces are on alert due to escalating instability in the West Bank, Gaza, Golan Heights, Sinai Peninsula and Lebanon. Israel is especially uneasy that Iran will make inroads into Jordan through proxy groups. According to Al-Jazeera, the recent protests in Jordan were led in part by a youth movement called Hirak Shababi, which Israeli intelligence accused in 2016 of being directed and funded by Hezbollah, Iran’s longtime proxy in Lebanon. The Israeli Defense Ministry does not want to see any form of Iranian proxy group take hold in Jordan. “They have taken crafty counsel against Your people, and consulted together against Your sheltered ones. They have said, ‘Come, and let us cut them off from being a nation, that the name of Israel may be remembered no more.’ For they have consulted together with one consent; they form a confederacy against You: The tents of Edom and the Ishmaelites; Moab and the Hagrites; Gebal, Ammon and Amalek; Philistia with the inhabitants of Tyre; Assyria also has joined with them” (Psalms 83:3-8). These biblical names are significant. Edom includes the Palestinians and some of the Turks. The Ishmaelites, descendants of Ishmael, are many of the Arab peoples throughout the Middle East and North Africa. Moab is the area of central Jordan. The Hagrites appears to refer to other descendants of Hagar, mother of Ishmael. Gebal, meaning “mountain” or “boundary,” is commonly equated with the Phoenician city of Byblos, modern Jubayl in Lebanon. Ammon refers to northern Jordan around Amman, the capital (which gets its name from Ammon). Amalek appears to refer to a branch of Edomite Palestinians. Philistia is the area around what is today known as the Gaza Strip. Anciently Tyre was a major city-state in southern Lebanon along the Mediterranean coast. Assyria ethnically appears to refer to inhabitants of Central Europe who migrated there many centuries ago, while geographically Assyria is in what is today northern Iraq. The children of Lot refers to Moab and Ammon—again, regions of modern-day Jordan. ●Jordan has an estimated two million Palestinians and 1.4 million Syrian refugees residing in the country. In a nation of just 9.5 million people, this represents over a third of the population. ●Alongside Egypt, Jordan is one of only two Arab nations to have made peace with Israel. In 1994, Jordan signed a peace treaty with Israel, ending the 46-year official state of war. ●Unlike the other Arab states in the Middle East, Jordan has no oil of its own.